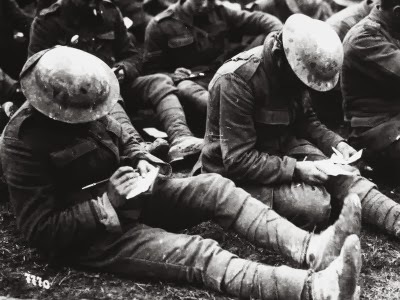 “The enclosed verses were found in a trench we occupied a short time ago, evidently scribbled down by someone to pass the time. And I, my two hours lonely vigil keep. I think of you, and all across the foam. Glad of no scenes like this at home. Some hero’s resting-place marks the land. Is crumbling ruins, and sad Decay. Vile Huns, who first raised War’s Alarm. The flash – the deadly sniper’s rifle gleams. And crouching low, in front of you. Your chum remarks, “It’s just gone overhead. While Dawn arises in the East. “Man’s Inhumanity to Man, makes countless thousands mourn. We think of our dear ones at home. Most sure of “Kaiser Bill’s” Defeat.